Keeping corn in it's green husks will render tenderness and the spicy herbed butter adds a tasty kick! Directions: In a small bowl combine butter and herbs/spices, mixing well. Set aside. Remove outside corn husks to reveal pale green and tender husks. Gently peel them away from the cob and remove all the silk. With a spoon, spread a thin layer of the butter mixture over the corn and gently bring the husks back into place. 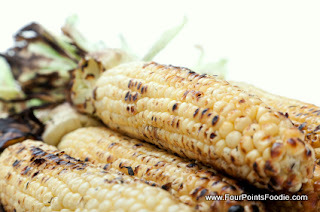 They will stick to the butter, but I like to use a husk to tie a knot at the top of each ear of corn. Grill over medium heat on your grill for about 20 minutes or until tender. To serve, have your guests peel the husks back and use them as a handle!